Recorded: January, 1981, at Soundmixers, New York City. Arrangement: Farlow's version is also in the standard key of C. The drummer-less guitar-piano-bass trio is a format Farlow frequently exploited in his career. 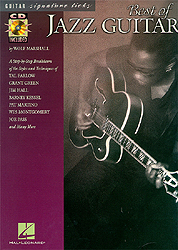 The head is a straight reading of the melody in A and B. Farlow then takes five improvised solo choruses in C, D, E, F, and G.
Signatures: The long strings of single-note lines found throughout this solo are unmistakable Tal Farlow. Farlow, with his fine technique and keen harmonic sense, was one of the earliest guitarists to play long complex lines of this type. His most telling melodies embody a mixture of Charlie Christian swing melodies and bebop horn phrases, and occur in measures 41-45, 51-56, 70-77, 86-92, and 104-111. Farlow's bop lines are complemented by groove riffs in measures 33-37, 64-68, and 96-98, and an occasional vintage swing/blues lick; the latter in no doubt a vestige of his Charlie Christian influence.